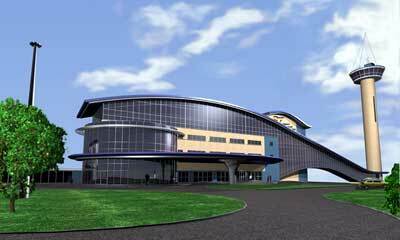 AECC installation project by GB Audio Services: sound system design, sale, installation, hire. 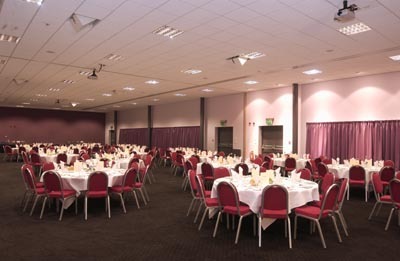 Aberdeen Exhibition & Conference Centre received a one year, £18M expansion and redevelopment in 2002. 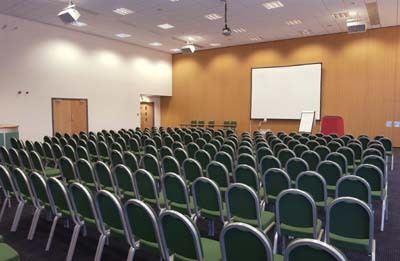 Two existing halls have been expanded to provide conference capacities of 2000 and 500 respectively and two new 700 capacity multi-purpose suites have been built. 40 Shermann Audio loudspeakers were specified throughout, following a successful demonstration of the three way R315W model. All speakers are roof mounted. There are twelve R315Ws in the Boyd-Orr Hall. To help achieve the required consistency two new, smaller loudspeaker models were developed especially for this project, with different profiles and finishes to suit the architect's aesthetic considerations, but with the same HF and mid range drivers throughout. 20 Chameleon power amplifiers were specified due to their sonic clarity and high damping factor which gives them the ability to cope with extremely long cable lengths. Mixing is carried out by 3 Allen & Heath GL3300 consoles and portable playback racks contain Tascam CD, cassette and Minidisc. Day 1 on site - This was the amplifier rack room before it had walls, door, ventilation, electricity, etc. Hard to imagine a public opening in a few weeks... ...but it did open on time with three suites functioning simultaneously.